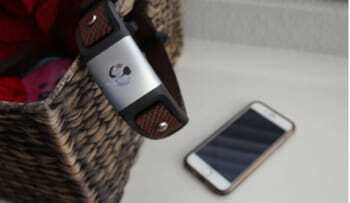 Waggit contains a piezoelectric flex sensor that measures heart rate, respiration and pulse. Two negative temperature coefficient (NTC) thermistors measure body temperature and ambient temperature. An LTE CAT M1 modem and GPS system measure boundaries, location, distance and speed, while the accelerometer and gyroscope read activity time and activity intensity. A speaker and vibromotor give vibration and audio cues for training the dog. The battery inside the collar is expected to last five days on a charge that takes a little more than an hour, but the campaign page says that time can be lengthened by using custom settings in the app. The major features of Waggit’s collar and app are tracking the health, sleep, activity, nutrition and safety of your dog. 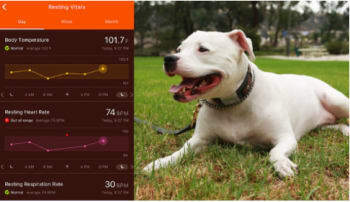 The app establishes a baseline for your dog and then alerts you when the dog’s behavior deviates from the baseline. Three sizes and multiple colors are currently available. Maybe the most striking thing about Waggit to me is how easily all of the things that I care about with my Fitbit translate directly to a dog’s health and wellbeing. The app is slick, with two years of development and hundreds of dogs used to test different breeds and types of fur. The best benefit that I see is the possibility to save on vet bills that easily boost into the thousands during a catastrophic canine health event. The only drawback is the GPS unit in the collar requires its own cellular account – six months are included during this Kickstarter campaign and after that the cost is $4.95 per month. This is a great campaign page full of bright visuals and showing the engineering development team with their dogs – the app even has a friend feature like a Fitbit that allows users to compete with other dogs. The campaign has blown by its initial funding goal and ends on December 1, 2017. Units are expected to ship in May 2018.